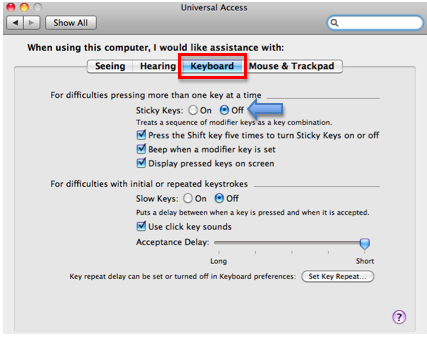 The Sticky Keys feature of Mac OS X makes some keyboard shortcuts easier for people who have limited dexterity. When this feature is on, you can press the keys for a shortcut in sequence instead of needing to hold them down at the same time. Select the On button next to Sticky Keys. 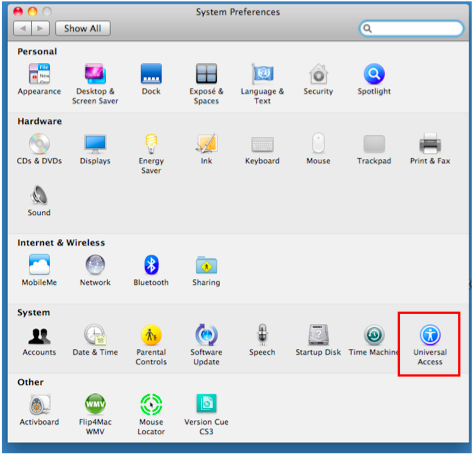 Press the Shift key five times to turn Sticky Keys on or off: enables a keyboard shortcut for Sticky Keys. Beep when a modifier key is pressed: provides feedback to let you know when modifier keys such as the Command or Shift key is pressed. Display pressed keys on screen: shows you the keys on the screen as you press them for additional feedback.